Take part in Loyalty Program and get special privileges! If the savings of accommodation exceed the sum of 50 thousand rubles, the guest becomes a member of the club of Kravt Standard level. 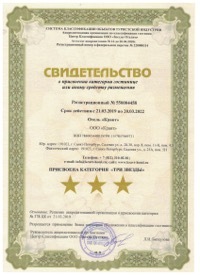 If the savings of accommodation exceed the sum of 100 thousand rubles, guest’s status rises to the Kravt Gold level. If the savings of accommodation exceed the sum of 250 thousand rubles, guest’s status rises to the Kravt Platinum level. * Late check-out is confirmed at time of booking. In case, if at the planed arrival date all rooms are occupied, we will inform you about it and will be happy to provide you with the room extension as soon as possible. ** Bathrobe and slippers in the room for the members of the loyalty program are available in all categories. If there are several guests a full set of bathrobe and slippers is provided for each guest. *** Five o'clock tea is available in the Grand Cafe on the ground floor of the hotel from 5 p.m. to 6 p.m. and includes coffee, tea, water, fresh pastries, mini sandwiches and croissants. – Please, inform us if you would like to use this service before 6 p.m.